Using dimmable light switches is a great way for homeowners to save electricity. 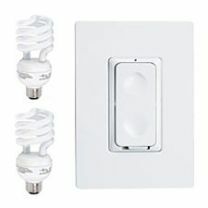 With dimmable CFL bulbs now on the market, using compact fluorescent light bulbs in your dimmable switches only makes sense. Compact fluorescent light bulbs have come a long way. However the dimmable CFL is still a relatively new technology. Since energy saver light bulbs work differently than traditional bulbs, it should come as no surprise that dimming is no exception. Traditional bulbs are dimmed by simply lowering the amount of electricity that is sent to the bulb. This generates less heat, and its this same heat that produces the light in traditional bulbs. So less electricity means less heat and in return equals less light. With most CFL light bulbs, dimming is more complicated simply because reducing the amount of electricity to a CFL bulb can also result in the bulb going out. With new dimmable CFLs certain adjustments to the ballets have been made. Dimmable compact fluorescent light bulbs don't quite yet have the dimming range that traditional bulbs have. Incandescent bulbs can be dimmed from 100% to 0% brightness. CFL light bulbs can only be dimmed between 20% and 90%. CFLs that work in dimming light fixtures are not easy to find simply because these energy star light bulbs must be specially made to do so. Any compact fluorescent bulb that can operate with a dimmable light switch should prominently state so on its packaging. Non profit groups like the Environmental Defense Fund help consumers identify which models are certified dimmable CFL bulbs. They also provide real product reviews from actual users. Not all dimmable compact fluorescent light bulbs will operate with all dimmer switches. The only way to truly know if a bulb will work is trail and error. Even go as far as testing the bulb in other dimmable light fixtures throughout your home. And don't forget to check the return and shipping policy, if purchasing online, before buying a dimmable CFL. Finally CFL light bulbs that give off cozy and warm shades of light. and the size and shape may determine which bulb is right for you. Before you make the switch, learn how to shop compact fluorescent light bulbs. CFLs do contain small traces of mercury; so proper CFL disposal is important. Use our savings calculator and see how energy efficient these light bulbs are. Join our new online CFL savings group. It's free and fast to join!